Monday March 26th 1883 It was a wintry day and we stayed right at home. I worked on my pillow case all the spare time I had. Tuesday March 27th 1883 I worked about the house all the forenoon and chainstitched in the afternoon. Hatt was over all the afternoon. Rob came home this morning and we had a talk tonight about things past, present & future. 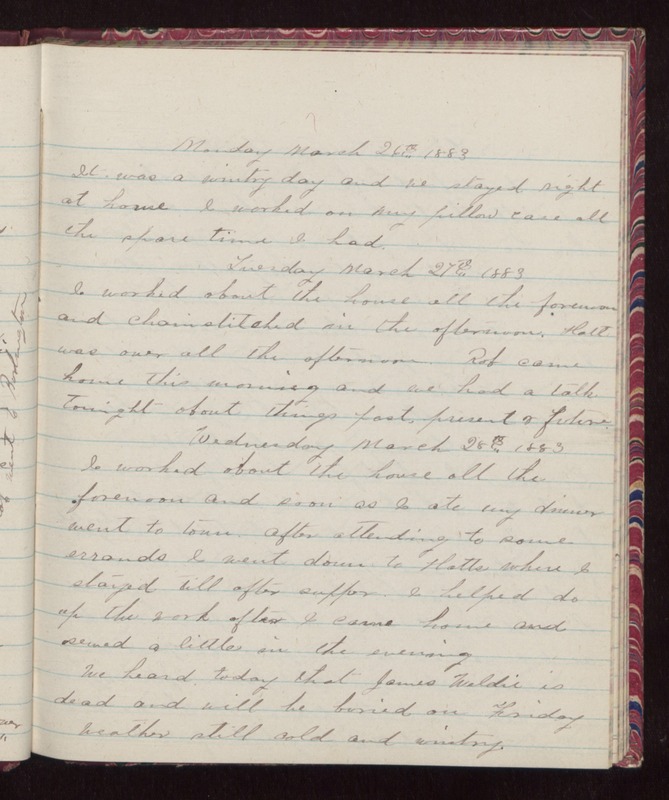 Wednesday March 28th 1883 I worked about the house all the forenoon and soon as I ate my dinner went to town. After attending to some errands I went down to Hatts where I stayed till after supper. I helped do up the work after I came home and sewed a little in the evening We heard today that James Weldie is dead and will be buried on Friday Weather still cold and wintry.